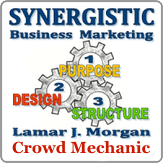 Testimonials from Linkedin for Lamar J. Morgan and Synergistic Business Marketing. Lamar has been a wonderful resource person for myself and many, many others. He is constantly reaching out and offering the opportunity for business professionals to advertise freely via his Feature Friday radio show--and even to be a Featured Guest with a 6-8 minute spot. He does many other things to help others so I highly recommend that you do business with Lamar if you are serious about yours. Lamar is an articulate and detailed individual. If ever you need a professional in your corner, Lamar is the person to call upon. Lamar has demonstrated his outstanding leadership abilities over and over again in the time that I have gotten to know him. Lamar is trustworthy and dependable. Lamar is committed to helping his clients meet their goals. Lamar managed numerous tasks simultaneously; he is mentally tough. Larmar Morgan exhibits great entrepreneurial skills in the area of social network marketing, promotion, blogging, creative writing and unique sales techniques. He is a wealth of information and a pleasure to work with. Lamar's unusually generous nature makes him a natural leader. Lamar and I have had numerous occasions to collaborate and express our thoughts and opinions of what works best in the world of social media to obtain real results. Because of my own journey within social media over the past couple of years, I was pleasantly overwhelmed by the extent of his knowledge. Lamar is truly 'on top of his game' and I would not hesitate to encourage professionals to place their trust in his ability to lead them toward success with a solid marketing plan. It is my pleasure to recommend Lamar! Bilingual Motivational Speaker, Coach, Conferencista "A Latina Without Limits"
I had the privilege of meeting Lamar through the Broward Business Connection. As I got to know him more and more, I saw the amazing knowledge he has when it comes to social media and Internet marketing. I also attended his "LinkedIn and Referral Page" workshop and left with the BEST information of how to promote myself online. I totally recommend Lamar to anyone who is looking to improve his presence online and offline. Lamar takes the time to get to know you and where you want to take your business. I recommend him highly. Thank you Lamar for all your help and support. If you want to get your business / marketing message out, Lamar is your man. He is focused and will do whatever it takes and do his best for you and your business. He is an internet marketing genius with a giving heart. I've worked with Lamar on marketing projects in the past and we work well together. I think Lamar would work well with any person or group to help market any service or product. Very nice, professional attitude. Lamar and I worked on several promotional projects. He is a bright, creative and driven individual and I enjoy working with him. Lamar has a passion for learning especially when it comes to anything techy! I enjoy his enthusiasm; willingness to share what he has discovered and his networking style. Lamar is an enthusiast for local community development and business to business networking. Over three years I've seen Lamar produce at least a dozen innovative ideas to promote Middletown, California. Lamar has successfully engaged people from around the world, including myself in this task. His work has been outstanding. V.P Special Projects BizHarmony / Lion 27,700 + direct cherished friends. Lamar is a trusted leader who encourages open communication and intellect. He is quick to think of solutions or alternatives to problems with multiple factors. Always upbeat, focused and ready to support. The level of passion and intensity that he brings to the table is contagious to the entire team. Lamar's professionalism and experience in the marketing and advertising industry is an incredible asset. The combination of entrepreneurial talent and a thorough understanding of multimedia opportunities in marketing and advertising has been instrumental in building his clients' success. Business-to-Business Relationship Building for Logistics Companies! Lamar is extremely gifted in the art of networking. He has showed me a thing or two. I personally think that he is a great addition to any team. I value my friendship with him and look forward to continuing to work with Lamar in the future. My contact with Lamar has been in online forums and also as an occasional bit part player in his projects to promote the Middletown Area Business Association. He is a man of exceptional vision, drive and infectious enthusiasm. Lamar has an amazing capacity to draw on people around the world to create understanding and global connections with his own community and region.